Sides are chosen. Alliances are made. Families are divided. The Truth have risen and now stand as the last remnant against the evil plans of Queen Anastasia. Eron and his brother Nagi must fight for freedom in the face of overwhelming odds and the threatened extinction of the Truth. Don’t miss the final chapter of the Forgotten Chronicles and the thrilling conclusion to Eron’s saga. As with book 2, this one picks up where the last one leaves off. That being said, I think this one could actually stand alone. The author does a good job of going over previous details relevant to this books events pretty well. I think having the full context from the previous books, though, made for a more thorough understanding of what was happening and ultimately enhanced my enjoyment of the book. The characters and narration are well done and I really liked where the story has gone. All in all, this is a great series that I've really enjoyed. Just a matter of hair and muscular development. The discovery that Queen Anastasia had maintained. the cruel system with a lie to cover the earlier transgression of the first Anastasia, has the Truths ready to prepare for war to give everyone what had been taken away from them: choice. The Queen has upset many of her advisors and a few were leaving her side. This deceptively simple portrayal of the characters and their ambitions covers a complex world of hope and betrayal and follows on directly from book two, Rise of the Forgotten. Although it would be possible to read this as a stand alone, the book works much better when taken in it's proper sequence as the third and final part of the entire Forgotten Chronicles. As with the earlier books, narration by English accented Paul Jenkins is clear, with good expression and individually voiced protagonists. His pace is matched to the text and carries the story forward well. A good delivery. 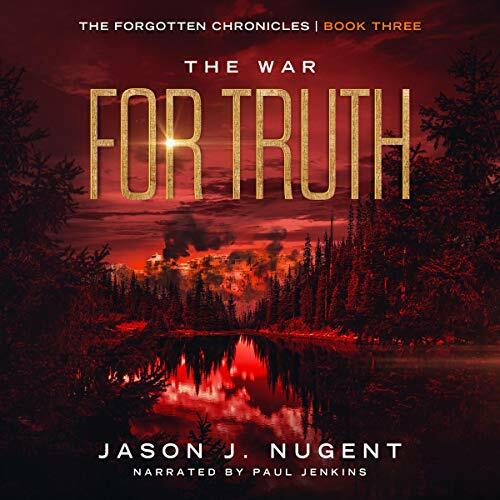 The War For Truth, is an exciting, full action story with vibrant imagery and a large cast of characters, which illustrates the cruelty that comes with ignorance, confusion, misunderstanding and corruption from above as well as courage, love and family bonds. My thanks to the rights holder who, at my request, freely gifted me a complimentary copy, via Audiobook Boom. An excellent young person's read as well as still being enjoyable to older SF audiences.